A while back we had a visitor at the shop who had some interesting things to tell us. Dee, was his name, and he passed thru on a sunny weekday in late June. He lived with his family at the Walasi-Yi Inn and Restaurant from 1958 to 1964, he told us, and said he had not returned in many, many years. We spent a good while swapping stories and walking around the property listening to the way things used to be back when he was a child. Dee standing outside of the breezeway. Dee lived on the mountain with his parents and his two brothers. They had several other family members that occasionally helped out in the Inn or Restaurant and a young girl named Margie who help out during the summer months. 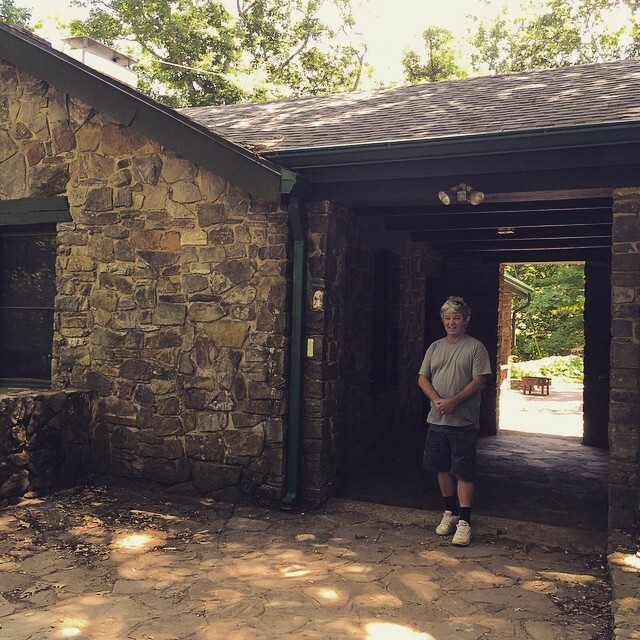 He told us that when the rooms filled up in the Inn, he and his family would clear out and make more room for visitors by staying at his grandmother’s house down the mountain in Blairsville. We took Dee into the staff quarters and the hostel, which are now separated but were once what made up the entirety of the Inn. He told us how he remembered the lay out being and how he remembered it always smelling like lavender from the fresh linens. The Inn and Restaurant stayed open year round and Dee’s mother did all the cooking. When the season began to pick up, family members came to help out. 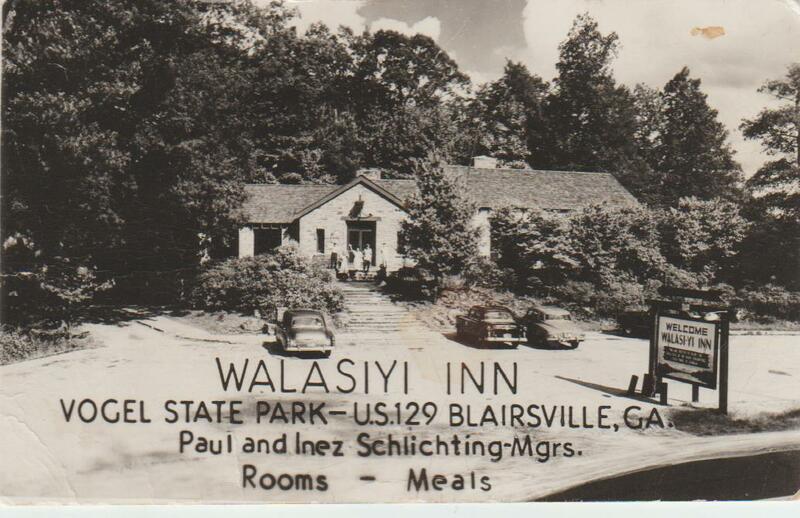 This is the Walasi-Yi Inn and Restaurant in 1954, four years before Dee’s family took over. Dee and his brothers had full run of Blood Mountain as children growing up. He said he remembers finding arrow heads of black obsidian around the areas of Neel Gap as they played in the woods. Just behind the stone building, today we see remains of a few cabins that housed men of the Civilian Conservation Corp during the its construction. Dee remembers a time when the first of the two cabins was still standing and was used as a shelter for hikers. One of my personal favorite memories of Dee’s was of “a little old lady hiking the trail.” He said she didn’t carry much but she was a tough lady with lots of hiking experience. He was spekaing of none other than Emma “Grandma” Gatewood! She passed through Walasi-Yi the first time in 1955 on her legendary thru hike and then again twice more in 1960 and 1963 on two other AT thru hikes. During one of these two other times passing through, she apparently made a great impression upon young Dee. Grandma Gatewood has an incredible story that was full detailed in Ben Mongomery’s book shown here. It was incredible to have a bit of living history among us and to learn more about what life was like at Walasi-Yi so long ago. If you or anyone you know have interesting history about Walasi-Yi, we’d love to know about it! This entry was tagged appalachian Trail, Grandma Gatewood, History, Inn, mountain crossings, Neel Gap, Restaurant, Walasi-Yi. Bookmark the permalink. Wow, very cool story. That’s awesome that he saw Grandma Gatewood!